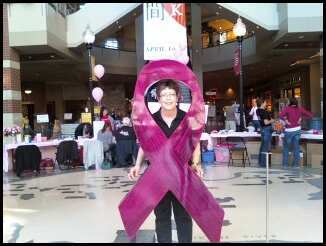 Mammograms Save Lives - and not just in October! I am sharing this link to an article about a Swedish study on mammograms. It is good news for anyone sitting on the fence of doubt about whether to have that mammogram or not to have it. The benefit of having more than one screening mammogram saved my life. I cannot tell you how happy I am today that I took the time to have that annual test. I don't mind them, especially now seven and one half hears after being diagnosed. I have been a slacker. 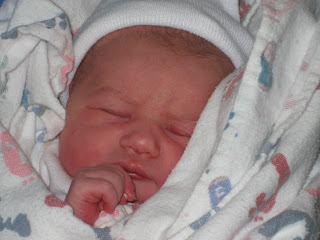 I have wandered around blogs and websites for projects while I have many to complete here at home. I have so many ideas of things I want to make that it is silly that I just haven't been motivated. 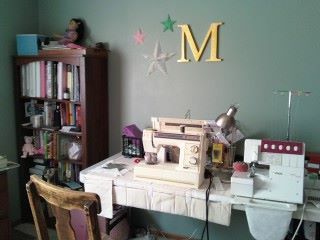 I am blessed to have a dedicated sewing room. The room is such a mess that sometimes I putz around in there thinking of how to better organize it all and then I am stuck and wander out with little to show for my time. 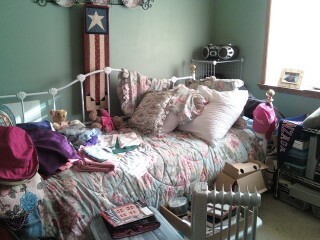 I think I haven't taken ownership of this room yet. Another perspective I have had is that I am trying to ask too much of this room. 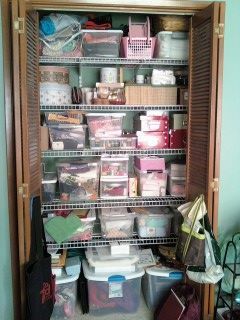 I have my scrapbook items crowding out some of this space and I pile office type things of my own in there. ﻿﻿﻿﻿﻿﻿﻿﻿﻿﻿﻿﻿﻿﻿﻿﻿﻿﻿ I am a piler, no doubt about it. I need to just take charge of this situation and tell myself that it is my personal space and I can do what I want with it. So to spur me on I am going to show and tell of my progress. This is a room that I close the door quickly to and don't offer visitors a glimpse of...so to do so is my way of sharing this project of becoming the proud owner of my own special spot where I will relax and create. Everything has its own space....sorta! My husband took the rods out of the closet and I promised it would be so neat and organized. The totes look great and while I am getting there I still have some organizing to do. Now I have to find a place to put all the extra tote bags and things that are hanging on the doors and laying in front of the closet. It has such a long way to go yet and I hope that by sharing my clutter with you it will spur me on to getting serious about making this room beckon me inside for bouts of inspiration and curiosity! I love my country, plain and simple. When my heart cries out how times are tough or the deeds of others leave me doubting faith in our fellow man, I am reminded of how our country started. It began with the faith that America would one day be a strong and proud nation. When I look at our flag I am reminded of the brave men who founded this country and the brave who fought to keep us free. "One flag, one land, one heart, one hand, One Nation, evermore!" - Oliver Wendell Holmes, Sr. The sun is shining, the birds are singing; pine pollen is drifting along the street, the deck, the plants and on the driveway. A fine yellow dust, pale enough to be overlooked until it gathers in an oily film spread across the puddles left by rain or sprinklers. Why am I paying attention to this much that causes such painful sinus allergies? Because after a busy day with a two-year old boy, the peace is so loud that I have paused before seeking solace with a book or my sewing room. Alas, grandchildren do add a different element to our home and if I could bottle that energy I would probably finish more projects! Resting after the long journey to start her life. 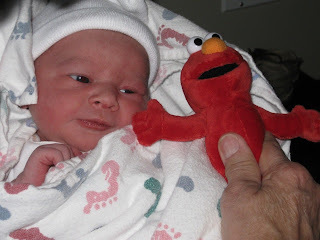 Ada is alert and smiling at the Elmo doll she gave to her big brother Thor.